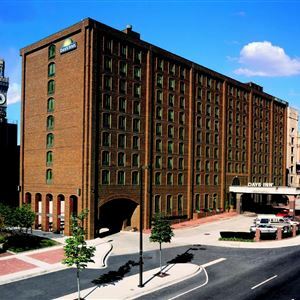 Property Location Located in Baltimore, Days Inn Baltimore Inner Harbor is in the business district and minutes from Baltimore Convention Center and Geppi's Entertainment Museum. This hotel is within close proximity of Hippodrome Theatre and Everyman Theatre. Rooms Make yourself at home in one of the 249 air-conditioned rooms featuring microwaves and flat-screen televisions. Complimentary wireless Internet access keeps you connected, and satellite programming is available for your entertainment. Private bathrooms with bathtubs or showers feature complimentary toiletries and hair dryers. Conveniences include laptop-compatible safes and desks, and housekeeping is provided daily. Amenities Enjoy recreational amenities such as an outdoor pool and a fitness center. Additional amenities at this hotel include complimentary wireless Internet access and concierge services. Dining You can enjoy a meal at a restaurant serving the guests of Days Inn Baltimore Inner Harbor, or find a snack in a coffee shop/café. Quench your thirst with your favorite drink at a bar/lounge. Business, Other Amenities Featured amenities include a business center, express check-out, and complimentary newspapers in the lobby. Planning an event in Baltimore? This hotel has facilities measuring 1400 square feet (130 square meters), including meeting rooms. Self parking (subject to charges) is available onsite. 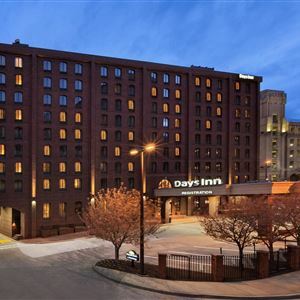 Located in Baltimore, Days Inn Baltimore Inner Harbor is in the business district and minutes from Baltimore Convention Center and Geppi's Entertainment Museum. This hotel is within close proximity of Hippodrome Theatre and Everyman Theatre. Make yourself at home in one of the 249 air-conditioned rooms featuring microwaves and flat-screen televisions. Complimentary wireless Internet access keeps you connected, and satellite programming is available for your entertainment. Private bathrooms with bathtubs or showers feature complimentary toiletries and hair dryers. Conveniences include laptop-compatible safes and desks, and housekeeping is provided daily. You can enjoy a meal at a restaurant serving the guests of Days Inn Baltimore Inner Harbor, or find a snack in a coffee shop/café. Quench your thirst with your favorite drink at a bar/lounge. Featured amenities include a business center, express check-out, and complimentary newspapers in the lobby. Planning an event in Baltimore? This hotel has facilities measuring 1400 square feet (130 square meters), including meeting rooms. Self parking (subject to charges) is available onsite.